As in any database application, there's good and bad. Angry Birds, but knocked free of advertising, is playable, but choppy - it's actually the case with most "games", and in general for all applications requiring a bit of graphics power (watch a video on YouTube 720p is an obstacle course). Applications such as the New York Times, Tweetdeck, or after Aviary are in contrast to successes. Leave the area covered by your WiFi network and you will have surprises: Angry Birds should work, unlike most applications. Even after Google's applications cannot be used on Chrome OS without connection! It's a real weak point: we are still far from having a persistent connection. Chrome started on OS, the writing of this test has finally been completed and iPad Mac: Cannot start any word processing application without connection. Why the devil to become entangled in this mess? Good question. It is hard to imagine a hacker Chromebook afford to activate its developer mode and have fun with the terminal (Ctrl + Alt + T, very few commands available): it goes fast, very fast in circles. The public enthusiasm traditional netbook certainly good finish, excellent autonomy, or ease of use, but will block facing the limitation of off-line mode. The eternal optimists will point the finger at the potential of this platform, but the naysayers will remind them to reason and with dismay, read the terms of using a Google account and the permissions left in some applications. In many ways, Chrome OS is a good system for Google.... She controls all layers (unlike Android, privatized by the different partners) and their application is in the center: what the sustainability of the Google advertising model. For now, however, the account is not there: what makes Google the user in exchange for his constant profiling is not enough that we can look if only one eye this platform - not to mention the "professional", Chrome OS is still too immature for the general public. We assume, however, that Chrome OS is a bet on the future, a time when the Facebook generation will be in charge, and where Web applications are more robust. One could of course long dissertation of the benefits (transparency for the user, client continuously, etc.) and disadvantages (questions about privacy, persistent connection, etc.). This approach, but must first decide on Chrome OS room. The OS is reduced to its simplest expression, do not expect to go very far with your devices, you can connect a (small) screen without difficulty, a USB stick, SD card and some cameras, camcorders and phones will be recognized as storage volume, and ... that's about all. Print? It will go through Google Print Cloud ... or not. Chrome OS is indeed unable to bind himself to a printer Cloud Print: The options available in Chrome are not in Chrome OS. You will have to either have one of the few Cloud Print compatible printers (the HP ePrint to simple) or have a Windows computer and connect your printer to Cloud Print, and not fail to draw a page. Obviously do not hope to use a scanner, a key 3G, a headphone / mic USB, or other device evolved drivers just are not there. Absolutely everything must go through the Web, which is not simple. Say you have a USB stick with a few documents, few pictures and some music videos. It will be recognized by OS Chrome and we can access its contents with the file browser (Ctrl + M). Edit a Word document? We must send it to Google Docs, and then change it there. If you want to save it to your key, it will download it, a round trip, in fact. Edit an image? Same thing: you must send it to Picasa, do the changes up there, and bring down the image. Watch a video or play a song? Yes, provided they are in standard formats supported by Chrome: MP3, H.264 and M4V ... that's about all. Do not expect to read a file MP4 QuickTime or DivX. Offline so there is no salvation: no Internet, Chrome OS is an empty shell. Let us be very clear: if you have a WiFi or 3G, the proposal made by the Google OS is interesting. The following online applications of Mountain View company has nothing to envy to native applications, Gmail, Docs, Maps, and the others are real pearls, each in their kind. This excellent battery life allows forgetting the charger at home, and this is fortunate: it is not the most compact in its class. You end up using this as using a Chromebook iPad: he can spend several days away from a wall outlet and use a few hours a day, always ready with its wake very fast. 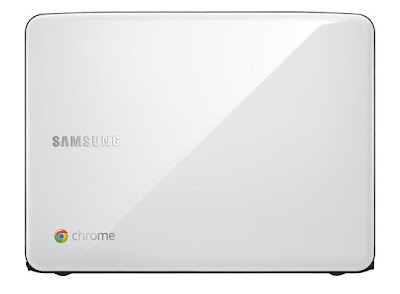 We return again to the lightness of Chrome OS and it raises the question what does this processor double heart, would he not had to sacrifice a little raw power (for even longer battery life), and example the graphics muscle (useful for acceleration and video decompression)? The lightness comes from its Chrome OS architecture: it is based on a Linux (Debian) stripped of all its dross. The sequence of starting a traditional OS is here reduced to its simplest terms: in 8 seconds, the kernel is loaded, the material started (no need for profiling, while side firmware is loaded), and the user can then identify. He is faced with a browser, Chrome. 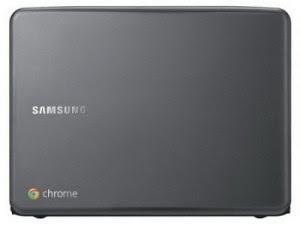 The first start Chrome OS takes a few minutes and cannot be done without internet connection. On leaving the board, it is likely that your Chromebook will need an update: Some system components are user side, but more importantly, the browser and applications are in the cloud. The key is your Google account: it allows you to connect, and also serves as a keychain. Passwords, history, bookmarks, applications, and even state of the machine, everything is linked to your Google account, so you can find your session by logging on to a new machine or the machine ... at another. The Chromebook indeed have a guest mode (off) allowing a friend or colleague to connect to the session without disturbing the administrator - we find here the logic of the old couple client / mainframe. We like ... or not. If the finish is good and the input devices pleasant to use, the screen, it is a real nuisance. Have 12 "with a resolution of 1280x800 on a computer of 29.4 x 21.95 x 1.99 cm and 1.48 kg is significant, it had already made the observation for the MacBook Air 11". The choice of a matte panel and a backlight LEDs promise a good experience. Alas, it is not: the contrast is absent, the brightness too high, the colors washed out completely. Nothing, not even the price as other netbooks have much better screens, justifies this failure in order. Finally, behind Samsung traps most of the ports. On the left side, there is the outlet, a vent fan (hopefully discreet), a trap door concealing a video port rare, mini-VGA (VGA adapter is included) and a USB port, and finally a jack input audio in / out. Right side, there is a second USB port and a trap door concealing a SIM slot and a switch to activate the OS developer Chrome. Before finally, there is an SD slot (HD / XC). Outside so, despite missing this screen, this Samsung Series 5 is more pleasant: it's a nice netbook, well designed without protrusions and vents diverse as sometimes found in this segment. 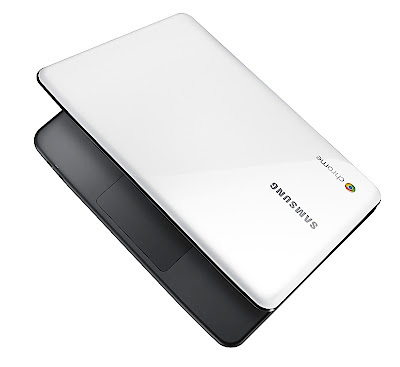 Inside, the Samsung Series 5 is a netbook everything from classic to 2011, the Intel Atom "Pine Trail" double-heart N570 clocked at 1.66 GHz with 2GB of DDR3 RAM through its 16 GB SSD storage format MSAT. The real star of this Chromebook however his 6-cell battery: it is simply unstoppable. The explanation is simple: Chrome OS is a very lightweight OS, which can be summed up in a big web browser, it is very applicant resources. Is achieved easily and 8-9 hours of battery life (Samsung announces 8:30), 8:00, passing a little time on YouTube, 9 hours, passing a little more time reading and a little less to watch videos. With Chrome OS, Google intends to revolutionize personal computing: the management of files over, no more updates, viruses and security vulnerabilities, welcome to instant start, synchronization continues, but also in all Google and while line. Chrome OS is actually a fully offset in the cloud - Google's servers - not turning as Web applications, because all PCs are primarily used for surfing. With the Samsung Series 5, the first computer OS Chrome, Google manage to impress, or is it ahead of its time? 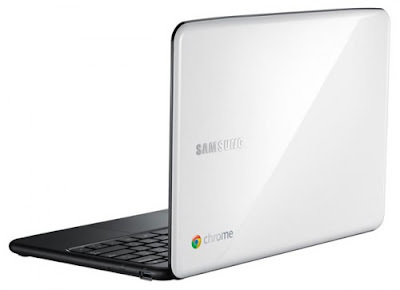 For € 400, the Samsung Series 5 is a good "big" netbook with a 12 "display, it is on the border with conventional laptops and although it is constructed of plastic, it is quite well done. The party higher fine enough is covered with a shiny white plastic messy and attracts fingerprints, while the rest of the machine is dressed in a black plastic mat the most beautiful effect recalling the example of black MacBook of yesteryear. Other features of this netbook are reminiscent of the Apple notebooks, starting with the keyboard / trackpad. The keyboard is one of these keyboards "chicklet" keys to separate: it is a little more comfortable than the MacBook Air 11 "and has a fast race and a shot dry. Google has customized some keys to adjust the keyboard to the needs of Chrome OS: the caps lock is replaced by a search key and function key deserve their name (last / next, refresh, switch to full screen, switch windows, brightness and volume). Finally, there is a dedicated key for switching on and off again like the MacBook Air. Such as the MacBook, the trackpad's 5 Series is quite comfortable: it is a fully clickable trackpad, no buttons, which recognizes a limited number of touch gestures (tap, double tap, tap with two finger scrolling, but nothing more). However, it appears to be less accurate than other models, those of the Mac or HP Envy example. You can of course connect a mouse, but the portability will take a hit, especially since there is no Bluetooth.